The plot itself came with a double garage already built on site, with an en suite toilet. When we began speaking to the Swartland Municipality about our plans, they told us that it was illegal to build any out buildings before building the main house. Yes, the previous owner built the garage illegally, but thanks to them breaking the rules, we have a small amount of space we can use for living quarters. It also means we have a most important basic necessity – a toilet. Thank goodness we don’t have to rent (and use!) one of those horrible plastic portable toilets. When I say it had a toilet, that’s what I meant. No basin, no shower, no bath. Just after we took possession of the property, Kevin and Louis spent a few days installing a shower, kitchen sink and a geyser. We used bookshelves, old filing cabinets, and other miscellaneous pieces of furniture to make a workable kitchen. The garage space is now the kitchen, one bedroom, Small Scale Engineering’s paperwork office and of course, bathroom. It has everything we need and even though it’s a bit rustic, it works well. We can cook and we can keep clean. So, what about the caravan? We borrowed a caravan from family and are using it as a second bedroom. The caravan tent is being used for storing our unused bigger kitchen appliances (eg. dishwasher) and several boxes of our possessions. 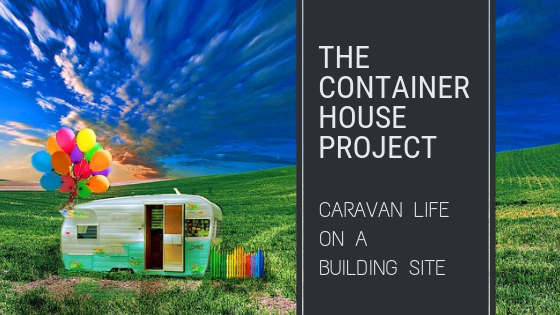 The caravan, understandably, has been affected more by the weather than the brick structure. That’s why this post is mostly about the caravan and the problems we have overcome in regards to weather. These issues are not such an issue when you’re on a short holiday. They become a little more of a problem when it’s your every day life. The biggest issue with winter in the Western Cape is the rain. Just after we moved in, the winter rains began and our yard flooded. It flooded to the point that we could not even see where we had dug the first holes for the container house footings. Even the caravan tent was swamped with water, while packed with all our appliances and several cardboard boxes of possessions. Two days later we had good weather so we could pull everything out of the tent and get it dried off. I took the opportunity to measure the mud line on our one appliance to see just how deep the water was in the tent. Result: 8cm! Louis got straight to work and put in some drainage channels for excess rain water but we weren’t going to take any chances. We bought a stack of cheap, second-hand pallets. Louis and Gwen spent some time making a floor out of the pallets and then rebuilt the caravan tent on top of the pallets. You’ve never seen a caravan tent with such a nice floor! The idea was that if the water levels rose that high again, the water would flow underneath the pallets and our possessions would stay dry. If the wood from the pallets has rotted by the time we take the tent down, we can salvage what is still good and throw the rest away. If it hasn’t, we have even more awesome pallet wood to use for projects. In the meantime, our boxes stay dry. I declare this to be a win-win situation. If you’ve ever made use of a caravan, you probably know that they can get extremely hot inside if the day is warm and sunny. For months we debated the pros and cons on putting shade cloth over the caravan in order to keep it cooler during our summer months. Well, we procrastinated and only got around to doing it recently. Quite a large structure was required in order to hang the shade cloth over both the caravan and the tent. So, Kevin welded up the frame in Epping from material bought from Steel & Pipe. We transported the disassembled pieces back to our plot and got to work. The shade cloth has made a huge difference to the temperature inside the caravan. It has worked out even better than we expected so we are very pleased with the results. Now we are just that little bit more comfortable as we continue work on the shipping container project. It looks like quite a big job to make and assemble that shade cloth but it sounds as if it’s been a great success. It’s hard to function in 40-degree temperatures at the best of times but in an overheated caravan it must have been near impossible. You’ll be much more comfortable now! Yes, it did take a bit of effort, but we are so glad we finally got around to doing it. Wow!, you guys have done well. Lots of hard work! That shade you made over the caravan etc. looks good. I love caravans. Those shade cloth sun-breaks do make a huge difference to the temperatures below. For some time now I have been contemplating doing something similar here to keep our work areas cooler during summer. And, if you ever do another cover of this sort I’ll sew it as a freebie. You can have it as an anniversary gift of some sort.